So, as an indie developer new to the scene, the thought of marketing my game has proven to be a daunting one. There are many avenues for marketing available through third parties, but indies rarely have the money for that sort of thing. posts before have gone into the various ways in which an indie can get their product out there on the cheap, but I want to talk about going a little bit deeper, and tell how you can use gamer psychology to your advantage to do a lot of your marketing for you. But before we go into that, the first thing that an indie developer really needs to do is to have their product displayed in as many places as possible. When starting work on BlogSpot account and did all of my updates on there. Guess how many people cared? None. And why should they? How could they even FIND the blog unless they were told about it? Take a search engine like Google. It has a “crawler” that goes around the web, finding pages, and finding all of the links on those pages. It analyzes where the links link to, and finds which pages have lots of links heading to them. If a page has hundreds of other pages linking to it, and lots of visitors, then it must be important, right? Well, to make your game more visible, you need to have lots of people visiting your page – a bit of a catch 22 – but you can help it by having a presence in many different places. Oh, and good news everyone… The Internet has many, many viable, justifiable places where you can put your game on show. For Malevolence, the first big step after BlogSpot was to create a profile on ModDB (creating a profile on one creates one on other other, too). They get quite a lot of traffic on there, and it will actually rank your game against others (a library of about 6000 games) in terms of how much traffic you get. It also rewards your dedication to the public by putting you on the front page whenever you write up a new update post. Given the way it works, and the attention that it gets, it’s very much worth taking the time to make your profile page attractive and thorough. That’s where a bit of the psychology comes in. I have noticed that gamers who browse ModDB for new indie games are a little bit like channel surfers. They flick through profiles quickly – bam bam bam – until they find one that appeals to them very quickly, and then they’ll stop and take a deeper look. So having lots of nice, bright screenshots, thorough videos and lots of clear, solid information about your game readily accessible for them will entice them to stay and take a proper look at your game. Once you notice that you’re getting more traffic, you can make a move towards putting links on your IndieDB/ModDB profile to other networks that you’re operating on. Some examples of which include YouTube channels, Facebook Fan-pages, Twitter accounts, etc. Any and all are good. Just be sure to make the links subtle. Some nice clean icons, perhaps. Gamers, I have found, dislike feeling like they are being bombarded. Do some research, take some time, look at successful pages and the way they’ve done things. It pays off. The social media avenue was the next step for me with Malevolence. It started with a YouTube channel where I would make a point to do screen-captures fairly regularly showing the progress of the game’s development. Many people either don’t enjoy or don’t have the time to sit down and read lengthy blog posts (he says in a lengthy blog post) and a nice, quick video can get the whole point across much faster and with more of a sense of interaction. Even taking the time to narrate the video can easily double or triple the amount of information translated in the same time frame. Things to think about there. After that came the Twitter. I actually expected these to be the most active of the network avenues for promoting the game, but in the end they fell into roles of keeping CURRENT fans up to date, and didn’t really do much to draw new fans. Though it seems obvious now, it took me a while to work out why this is. Most people on Facebook and Twitter these days use them on their smartphones, rather than their computer. While it IS possible to go browsing for new content via the smartphone interfaces, they are much more designed to just keep up with what their already follow. That’s not to say that you can’t still make use of these avenues though, as they offer quick and easy mini-update portals for you to address your current fan-base en-masse, and quickly spread links to any major blog updates you do elsewhere. For the longest time, Steam was one of the holy grails of indie games “making it” and a profile for Malevolence on there thinking “wow, I might be in for a chance”, and things went fairly well for a time, but then started petering off quick quickly. Valve kept altering and adjusting the vote process for getting games approved and it was quite drastically affecting my game’s ability to get noticed on there. It’s been quite frustrating until it got me thinking… How WOULD you make an unbiased system for gauging a game’s popularity in the middle of a firmly established community of over 50 million users? The more I think about it, the more complex it becomes in my head. Sure, I have lots of problems with the way the Greenlight process works, however, since I can’t come up with a better one myself, I’m happy to leave it up to them to sort out. I’ve had many heated discussions with fellow developers about how the system should work… Mainly about the apparent pointlessness of having a “no vote” button (which I’m sure will create some lovely ‘discussions’ in the comments) however, as I said, I’m happy to leave the process up to Valve, as they would certainly know best. Of all the networks I’ve gotten Malevolence onto, that’s the only one that hasn’t really gone anywhere yet. As the owner of it I can watch the percentage of votes go up and down, and I can’t really make sense out of it, so I’ll just keep doing what I’m doing and hope for the best. The only advice I could give to other indies attempting it would be to make sure that all of your avenues (Facebook, IndieDB, dev blogs, etc) point to your Greenlight so that you can funnel as much of your traffic into it as possible. HOWEVER, all of that only depends on how badly you want to get onto Steam. I’m aware that some people don’t. Some because they just don’t like how Steam operates, others because they’re making mobile games and it’s kind of useless to them. I, personally, am trying to get on there, but that doesn’t mean that everyone SHOULD. But I digress. What about the psychology mentioned earlier? Well, that is where your marketing plan comes from. Just sticking your product on some blogs and social network sites isn’t really a marketing plan. It’s just a means to give your game a ‘presence’ on the Internet. A solid presence is a powerful thing, but it takes constant maintenance. It’s not something you can set and forget until you have a large, strong, dedicated community to do it for you. As an indie, that’s just not something that’s likely to happen straight up, so it’s something you’re going to have to do yourself. KEEP your blogs updated. RELEASE lots of screenshots. RECORD lots of videos. ANSWER lots of questions, and above all, MAKE SURE that your community is reminded regularly that you are still working on your game, lest they lose interest. TARGET AUDIENCE: What is the target audience for your game? You can’t just say “gamers” because not all gamers like tower defence games. Not all gamers like FPS games. Not all gamers like RPGs. And then, even within the types there are sub-types. In the RPG player genre there are gamers who like first person RPGs, but don’t necessarily like isometric RPGs or turn-based RPGs. So it’s a matter of specificity. Take the time to work out precisely what your target audience is with your game and market mainly towards them. There’s not much use in wasting energy trying to talk to people who aren’t interested in listening! ANALYZE: Take the time to analyze the way your target audience acts. Do they talk amongst themselves? Do they operate vocal communities? Is theirs a community of sharing, or of bragging? As an overly abrupt stereotype, FPS gamers tend to have communities that are much more vocal and aggressive than communities of RPG games. I realise that’s a massive generalization, and it is most certainly not ALWAYS the case, but if you look into how the communities of your target audience operate, you can use it to your advantage when creating your marketing plan. ACT AND REACT: As an indie, much of what you learn, you will learn on the fly. If you make a marketing faux pas, you will learn about it pretty quickly. Try not to be too stubbourn about things. While it can be trying at times, an indie game without fans/players, is nothing. It’s like owning a coffee shop that has no customers. Don’t be too hard-headed to change the way you operate if it’s something small and it keeps people happy. You need to be adaptive, you need to listen and you need to communicate. So, with these things, you can create your marketing plan. As an example, my marketing plan for Malevolence was to make use of the RPG communities idiosyncrasies. I did my research, joining forums and following blogs, doing the whole Jane Goodall thing and “living with the apes” so to speak (not calling RPG players apes, by the way. Just using a metaphor) and I found that a common trait among them is that they are excited about indie RPG development and will quite often share links to interesting indie RPG projects that they find. BUT, at the same time, while there is a lot of link sharing going on, there isn’t much response to it. Many RPG forums will have an entire section just for sharing indie RPGs that people have found. These sections are often filled with lots of posts with links, but the posts won’t often have many responses. That doesn’t mean that people don’t follow the links, but it means that there is more excitement about sharing the links than there is about the games themselves. RPG fans seemed excited about the IDEA of new RPGs, which is cool. I made a note of this and built my strategy around it. I planned to start my marketing push at the same time that Skyrim came out. Sounds crazy, right? Well, there was reason behind my madness. I started pushing the links to my various blogs, etc, on forums and other hubs while people were busy getting fussy over Skyrim. The community saw my links and shared them around, but, as expected, not much action happened other than the spreading of the links. Because of this, there ended up being many, many sites with references to this infinite indie RPG. As it spread, more people heard about it, but they didn’t focus on it because… Hey… Skyrim… But that was precisely my plan. 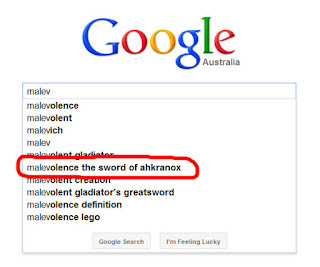 They barely have started typing the word Malevolence, and it shows up. Marketing plan complete. That being said, they may go to the site, look at it and hate it. I unfortunately can’t help you with that. Marketing is one thing, but your product still needs to stand on its own. I was lucky enough to have this strategy work quite well for my game, but sometimes even the most well thought out strategy will fail. Not having a strategy at all, however, will pretty much guarantee that you’ll fall short, so start early! But that’s where I’ll leave off, I think. In conclusion, when marketing your game, you need to take the time to establish a web presence, develop a marketing plan based on research and analysis of your target audience and attention to detail when looking into the psychology of the way they act as a community. Stick with it. If you believe in your game strongly enough, you won’t have too much difficulty in translating that to your viewership!